Jalapeno & Chs Smokie Meat Sticks Enjoy the heat with our gallon size hot barbecue sauce! SERVING CUSTOMERS ACROSS THE UNITED STATES. The Yoder family has been in the meat processing business for over 3 decades. We have developed a keen interest in producing high-quality premium meat snacks. Focusing on premium and consistency keeps our customers coming back for more. It is especially important to understand and know where the product originates as well as how it is processed. We hope you will enjoy these meat snacks as much as we have. 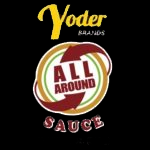 Contact Yoder Brands today to learn more.